One of the Greek Cyclades Islands and located in the South Aegean, Santorini has a famous volcanic past, which has very much shaped the island that you see today, creating a surreal and rather unique landscape in places. The water-filled 'caldera' crater remains a familiar sight to all those who visit Santorini and is surrounded by a wall of colourful cliffs, which are often cram-packed with charming houses. Santorini is also known for many other things, namely its beautiful beaches, ancient archaeological sites, its busy port at Athinios, and of course its quite amazing sunsets, which seems all the more spectacular when views from the village of Oia, on the island's far northerly tip. 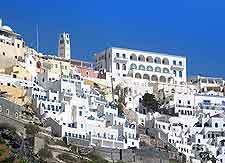 Fira is the island capital and stands next to the caldera itself. Whilst Fira does not actually offers its own EOT (Greek National Tourist Information Organisation), it does contain a number of helpful travel agents, which are usually only too happy to impart their tourism knowledge. The beaches of Santorini are often extremely distinctive, featuring dark volcanic sands, which can often become extremely hot, making a sun lounger or towel very necessary at times. In general, the very best beaches on offer tend to be clustered around the eastern coastline. Always popular is the stretch found at Perisa, while a little to the south, Perivolos Beach is also extremely noteworthy, as is Red Beach, close to Ancient Akrotiri, where the tall red cliffs are hard to miss. Situated around 10 km / 6 miles from Fira, Kamari Beach is amongst Santorini's biggest and most developed resorts, framed by a backdrop of limestone cliffs and also the Cape Mesa Vouno. 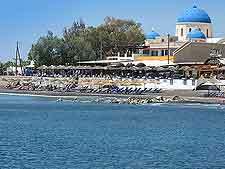 More information about Santorini Beaches. 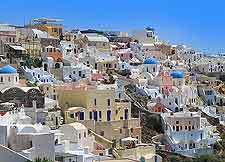 A number of Santorini's main tourist attractions are never far from the beaches, with many residing within both Fira and Oia. The cable car rides of Fira are always busy, and although the journey is quite brief, the views and overall experience are very memorable. Also appealing are the countless villages strewn all over Santorini, where beaches, whitewashed churches, vineyards, Greek tavernas, boutiques and local markets all away, especially within the villages of Megalochori, Mesaria, Perissa, Pyrgos and Vlichada. 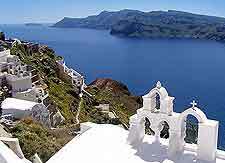 More information about Santorini Tourist Attractions. During 1956, Santorini was struck by a damaging earthquake and a number of its most historic buildings were destroyed. However, many still remained standing or have since been restored, and so the main streets remain full of character, particularly around Fira, where its Catholic Cathedral is one to look out for. For something a little older on Santorini, check out the remains of an ancient settlement in Thira (Thera), which date from the 9th century BC and are surprisingly elaborate. Visitors to Ancient Thira will find information about its temples, Roman mosaics, marketplace, theatre and Byzantine influences. More information about Santorini Landmarks and Monuments. Tourists spending a holiday on Santorini often try to make the very most of their time of the island, cramming in every possible attraction. However, the opportunity to sightsee is broadened even further by Santorini's proximity to further Cyclades and other Greek islands. Connected by frequent ferries are the islands of Crete, Ios, Mykonos, Naxos and Paros, to name but a few, each of which is equally inviting and offers something rather special. More information about Santorini Attractions Nearby.